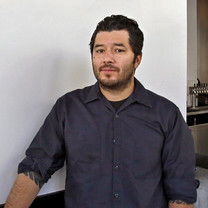 Raised in San Antonio, Texas, and based in L.A., Chef Josef Centeno comes from a family of foodies: his father was a butcher; his paternal grandfather started Centeno Market in San Antonio; and Bar Amá, one of his restaurants, is named after his maternal great-grandmother. His is also the owner of Bäco Mercat, Ledlow, Orsa & Winston, P.Y.T. and BÄCOSHOP. "The pork here is salty, crunchy, fatty, and succulent—just the way pork was intended." "This is one of my favorites of Judy Han's sandwiches. Her version of a bánh mì has soft yet crisp ciabatta with caramelized pork belly, pickled daikon, and carrots. I think it's the caramelization on the pork and the chili aioli that does it for me." "I'm here for the same reason as everybody else is: the sweet 'n' salty, so-tender-they-fall-off-the-bone marinated pork ribs." "I love this salad for its freshness and simplicity. 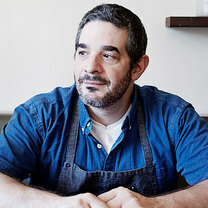 It has crunchy hearts of escarole and paper-thin slices of shaved, raw sunchoke with a bright preserved-lemon vinaigrette and house-smoked almonds." 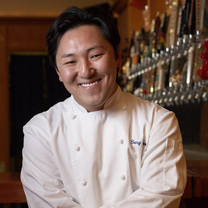 "Sang Yoon's take on southern Chinese and Southeast Asian cuisine is unique and nuanced. The spicy chicken pops are Frenched chicken wings with tons of flavor and just the right amount of buzzy heat from Sichuan peppercorns." "we just had to go back to @#birdiebebrunchin"
"Flamin’ Cheeto Pie available off menu @bar_ama 🔥🔥🔥"
"Sunchokes with white anchovy, calabrian chile, capers, lemon & radish @bacomercat ⚡️"
"Sugo of fresh cannellini bean, tomato, okra & arugula pesto with goat cheese toast and dry mole @pytlosangeles"
"Why I love @#americanmastersdinner, he sends me Nachos with Caviar!" "Japanese black sugar canelé for Brunch @orsaandwinston today! 🥐🐶🐶"